EghtesadOnline: German Social Democratic challenger Martin Schulz returned to his European Union roots in a speech to several thousand supporters in Frankfurt, accusing Angela Merkel of souring relations with EU allies and being unacceptably vague on plans for euro-area integration. Speaking on the German financial capital’s Roemerberg square in the shadow of the financial capital’s medieval city hall, the former European Parliament president painted a picture of an imperious German chancellor dictating policy to all the continent aided by her finance minister, Wolfgang Schaeuble. 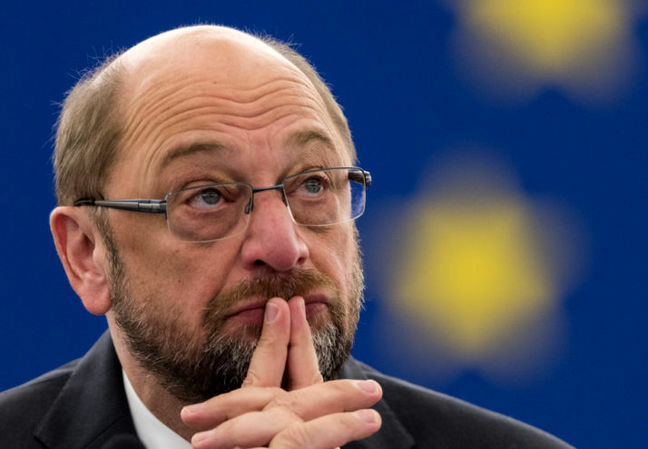 According to Bloomberg, Schulz’s appearance on Friday rounded out a week in which he’s rallied base supporters in Social Democratic urban strongholds. As both candidates crisscross the country a month before the Sept. 24 election, the SPD leader has escalated his political attacksagainst the chancellor as he seeks to claw back her poll lead and prevent a fourth Merkel term. Schulz broadly stuck to his stump speech, slamming Merkel for not doing enough to keep down rents and promote gender equality. He landed another blow on auto executives in the widening diesel-emissions crisis, saying they were bent on short-term profit and collecting bonuses. He also went after one of his favorite targets: President Donald Trump. “Men like Trump, representatives of the politics of infamy -- these are the kinds of people we need to stand up against,” he said. Merkel has taken mostly to smaller towns to shore up the Christian Democratic vote outside the urban centers. Her first of two campaign appearances Friday was in the Bavarian spa town of Bad Kissingen, population just over 20,000. Schulz began his tour this week in the SPD-dominated city of Bremen, then moved into Germany’s industrial heartland. The party counted 4,500 in Essen on Thursday. Polls all still show Merkel with a commanding lead, leaving Schulz to count on a surge in support in the final weeks of the campaign. Backing for Merkel’s Christian Democratic-led bloc slipped 1 percentage point to 39 percent, according to an FG Wahlen survey for broadcaster ZDF on Friday. The Social Democrats, which had 32 percent support as recently as April, dropped two points to 22 percent. The populist Alternative for Germany, the anti-capitalist Left party and the pro-business Free Democrats all gained a point to reach 9 percent apiece, while the Greens held at 8 percent.